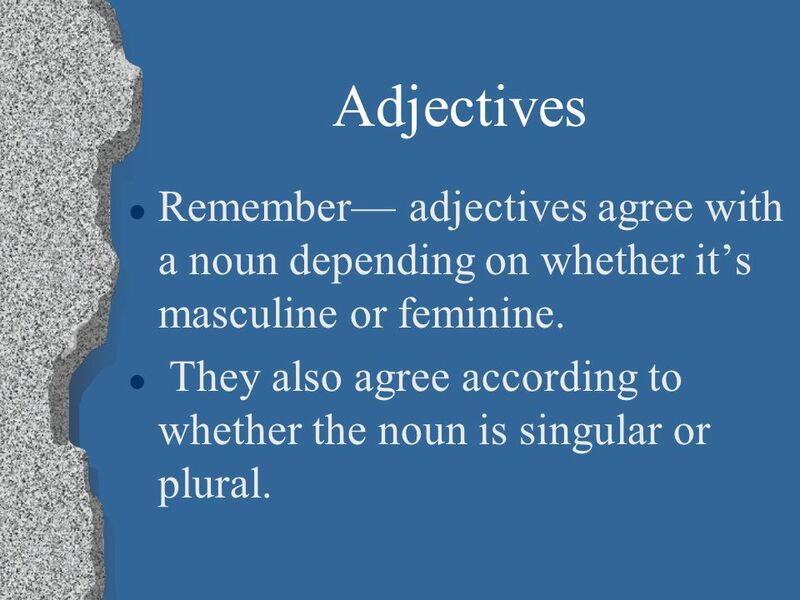 2 Adjectives Remember— adjectives agree with a noun depending on whether it’s masculine or feminine. 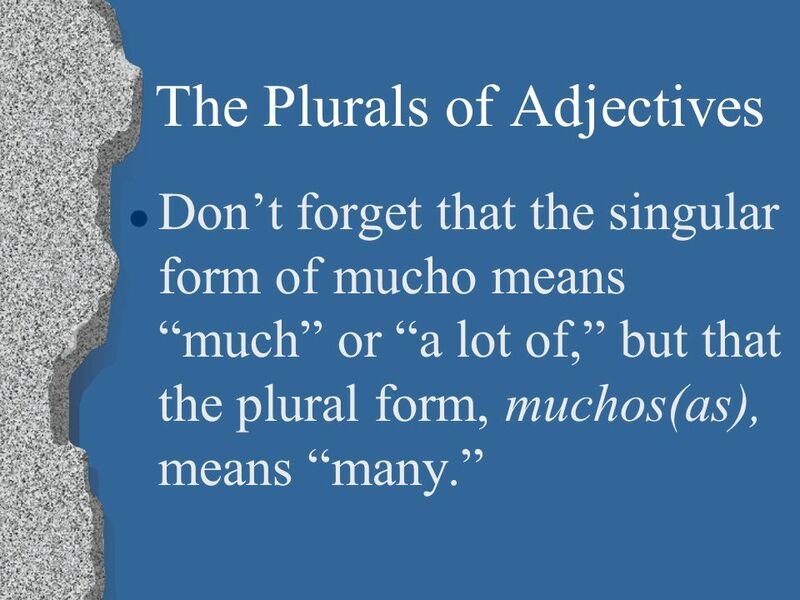 They also agree according to whether the noun is singular or plural. 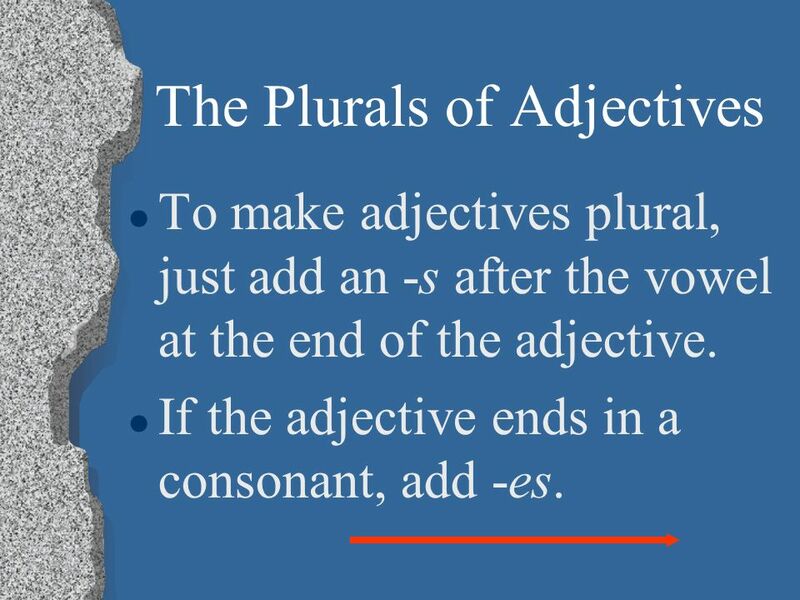 To make adjectives plural, just add an -s after the vowel at the end of the adjective. 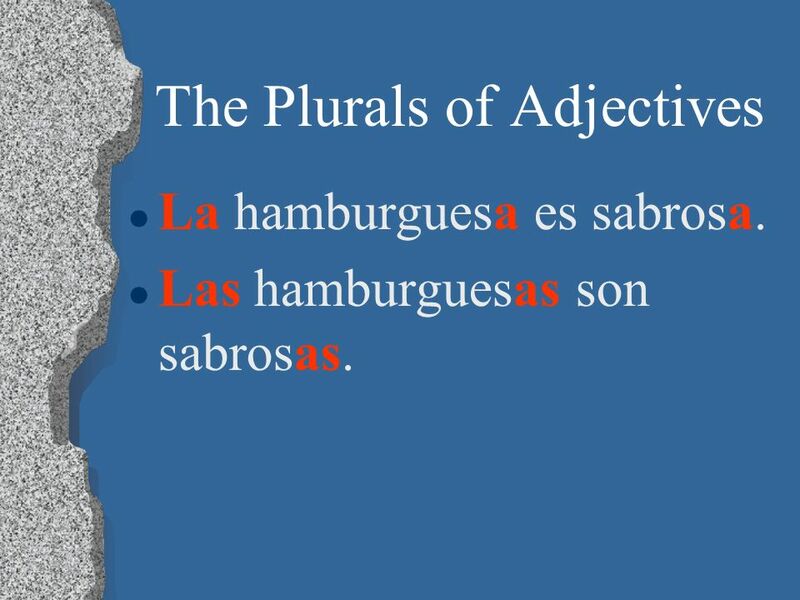 If the adjective ends in a consonant, add -es. La hamburguesa es sabrosa. Las hamburguesas son sabrosas. El pastel es muy popular. Los pasteles son muy populares. 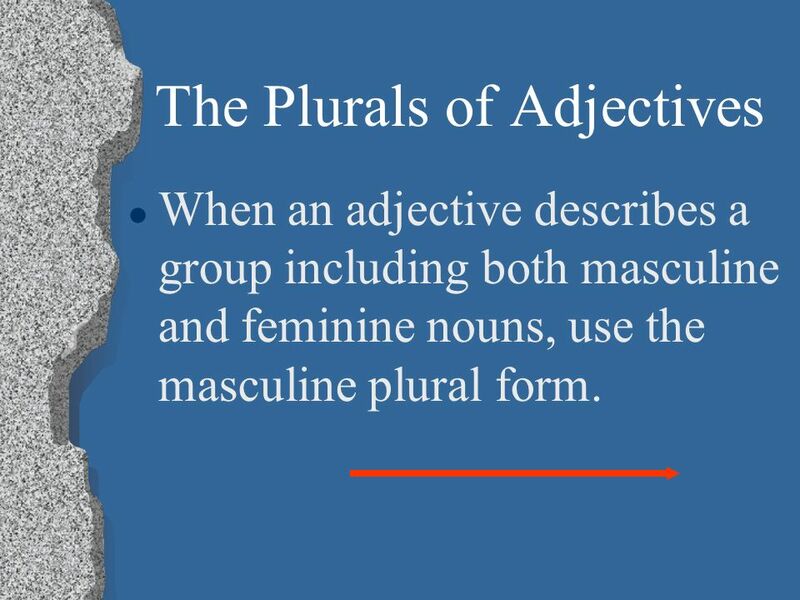 When an adjective describes a group including both masculine and feminine nouns, use the masculine plural form. La lechuga, las zanahorias y los tomates son buenos para la salud. 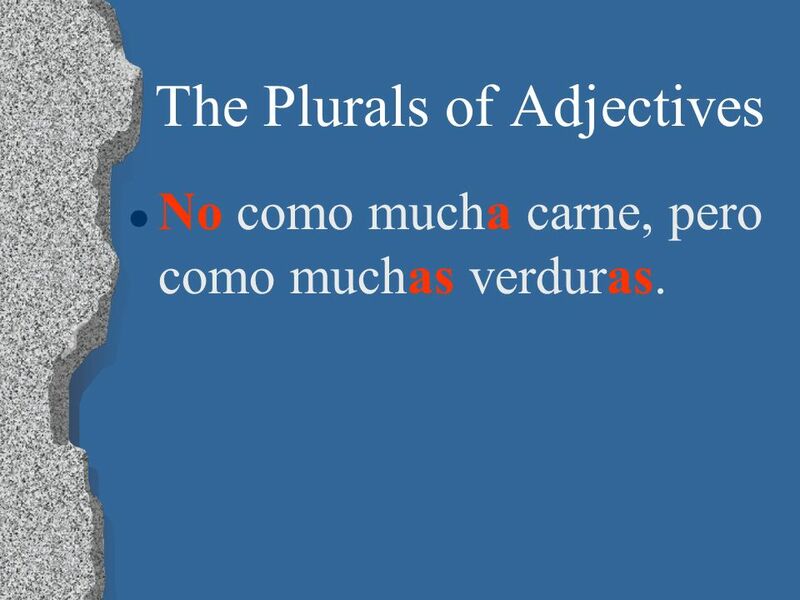 No como mucha carne, pero como muchas verduras. All forms are totally irregular. They follow NO pattern. 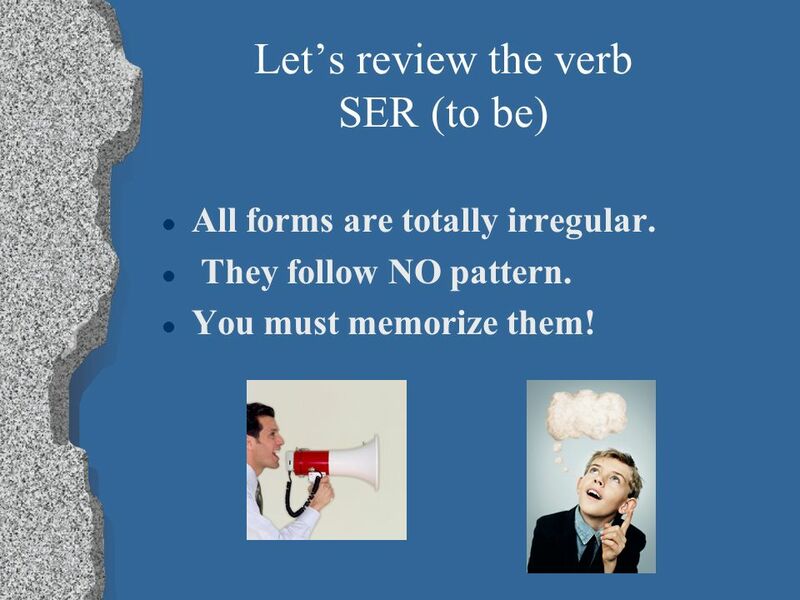 You must memorize them! 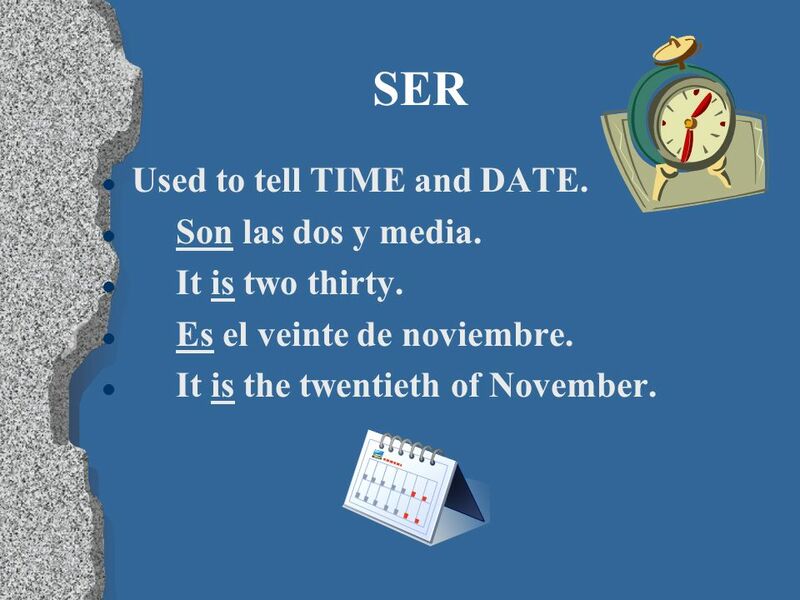 13 SER Used to tell TIME and DATE. Son las dos y media. It is two thirty. Es el veinte de noviembre. It is the twentieth of November. 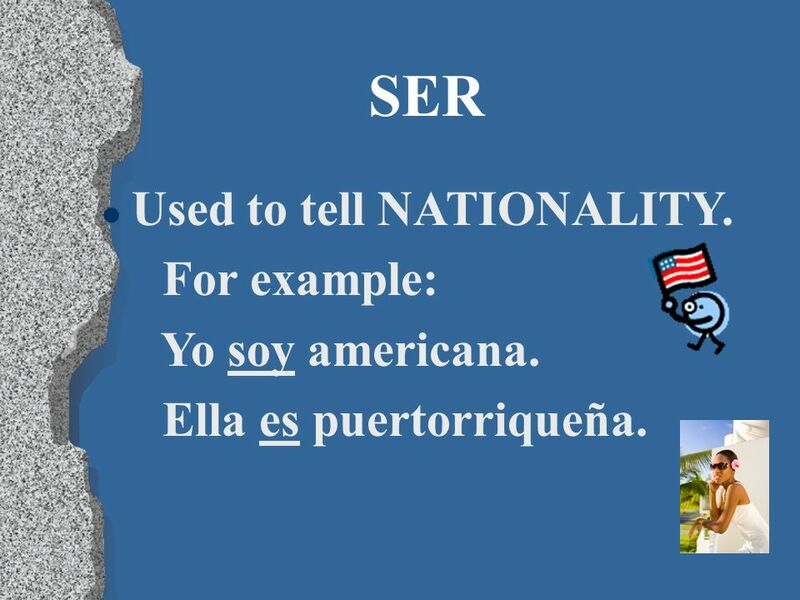 14 SER Used to tell NATIONALITY. For example: Yo soy americana. 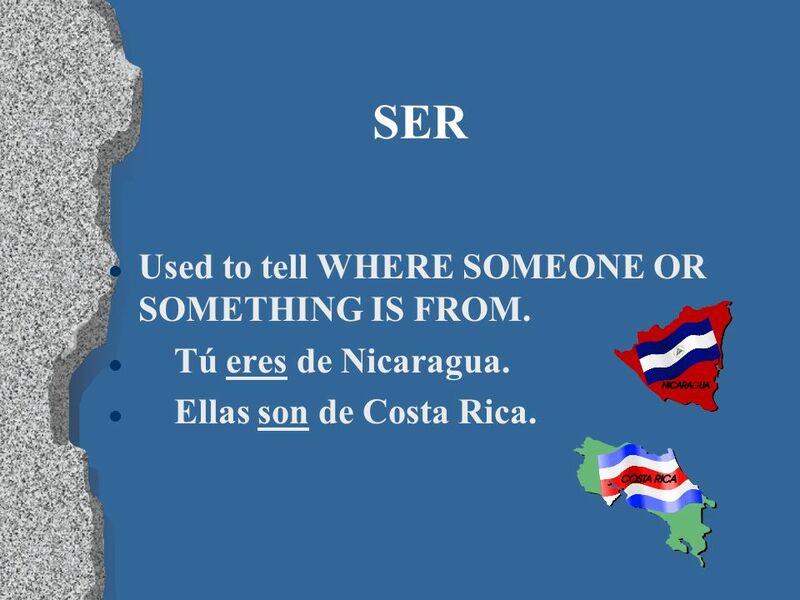 15 SER Used to tell WHERE SOMEONE OR SOMETHING IS FROM. Tú eres de Nicaragua. Ellas son de Costa Rica. 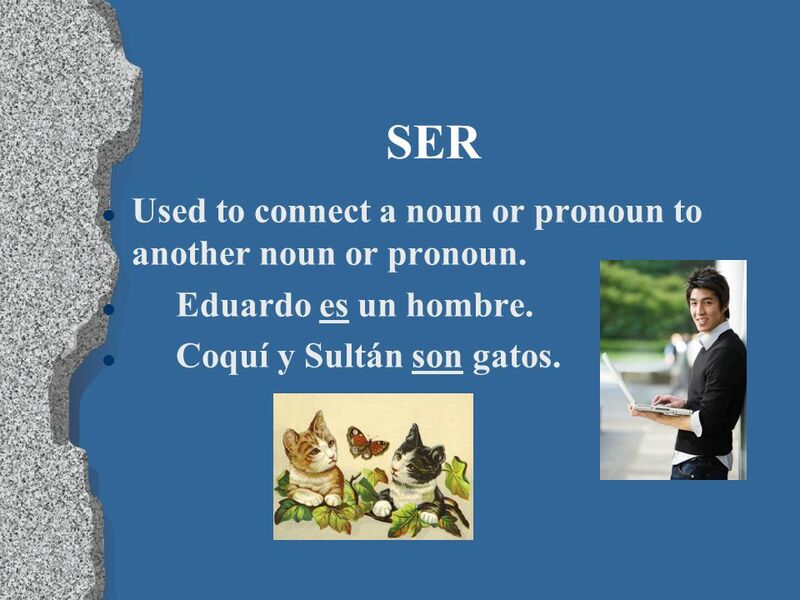 16 SER Used to connect a noun or pronoun to another noun or pronoun. Eduardo es un hombre. Coquí y Sultán son gatos. 17 SER Used to describe CHARACTERISTICS. Rebeca es alta. 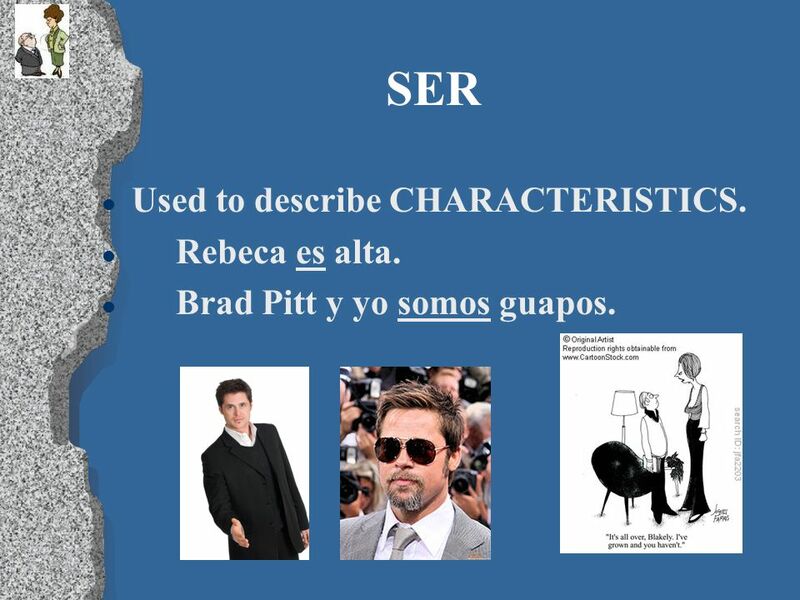 Brad Pitt y yo somos guapos. 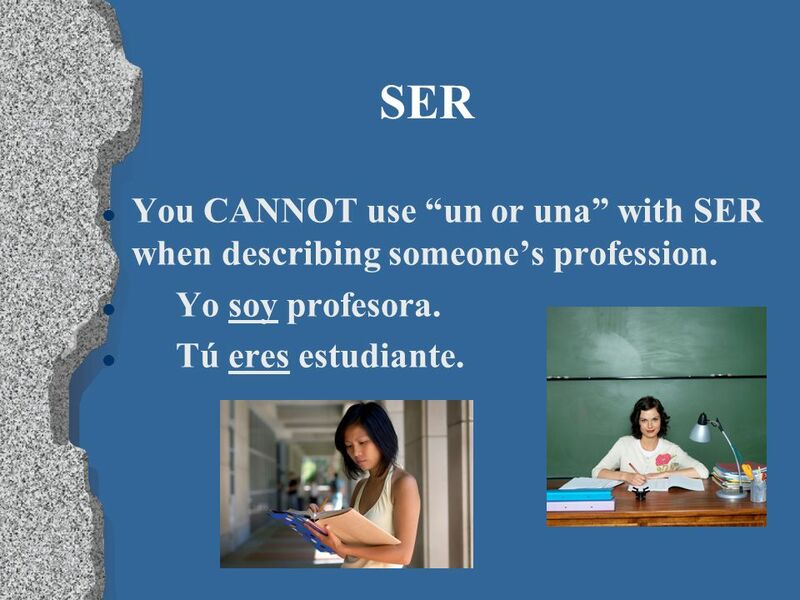 18 SER You CANNOT use “un or una” with SER when describing someone’s profession. Yo soy profesora. 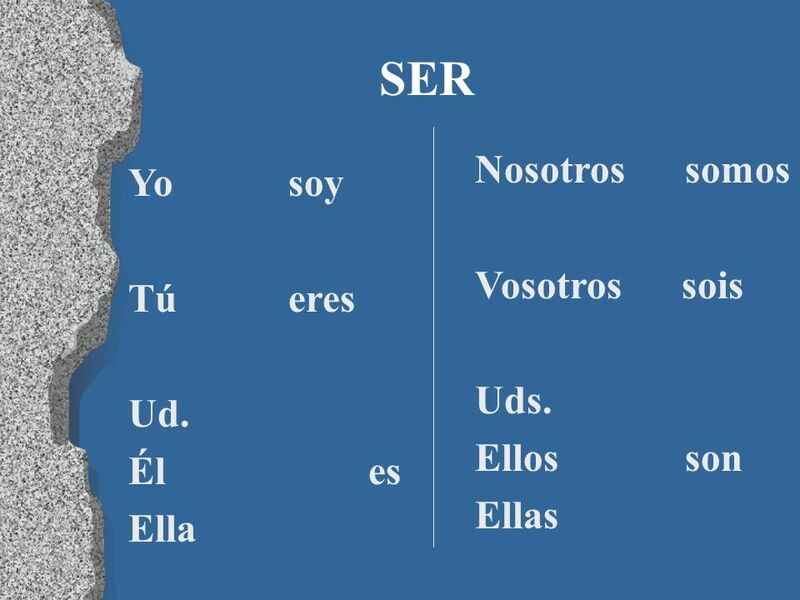 Tú eres estudiante. 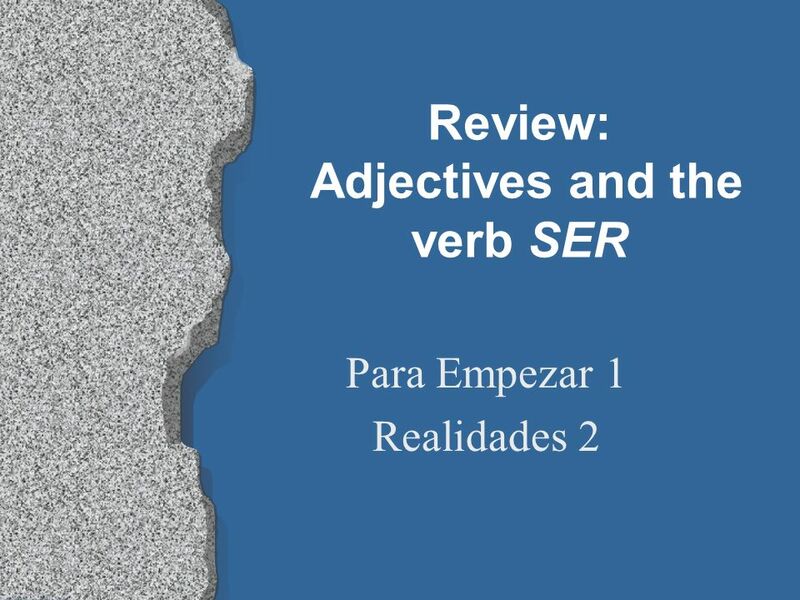 Descargar ppt "Review: Adjectives and the verb SER"
YOSoyI am TúEresYou are Él Ella EsHe is She is Nosotros(as)SomosWe are Ellos, Ellas Ustedes SonThey are You all are Use ser to describe what a person. 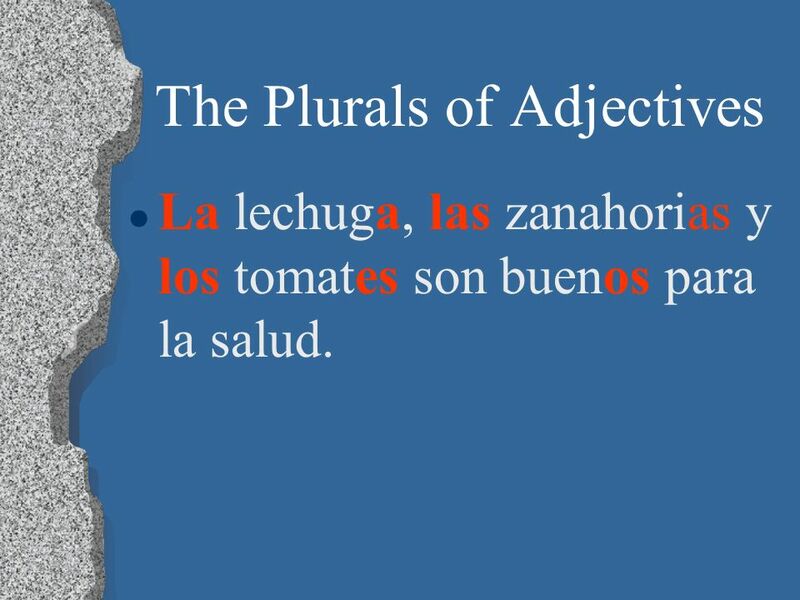 Capítulo 1 Adjetivos (Adjectives). 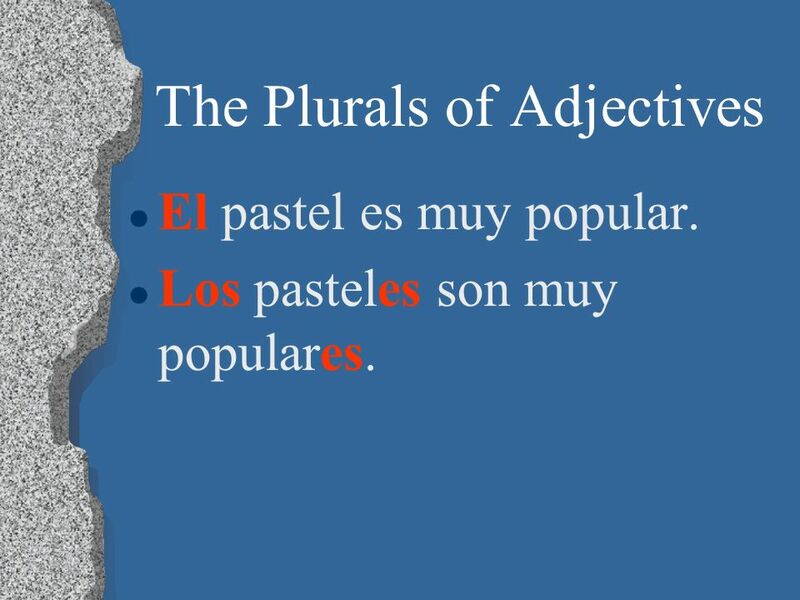 Words that describe people and things are called ADJECTIVES (adjetivos): 1. 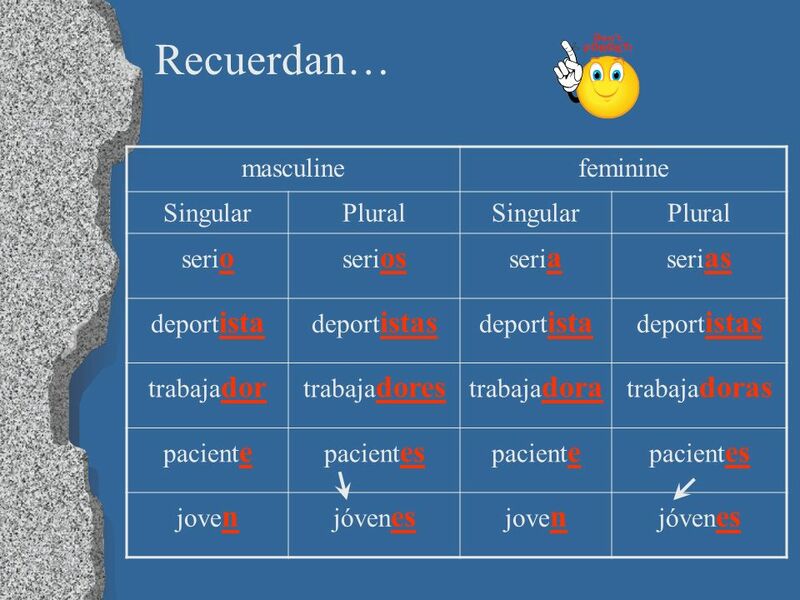 In Spanish, most adjectives have both masculine.